My sabbatical during the year of Jubilee last year was anything but restful. I did not work, I did no outreach ministry and it offered me some time to heal and re-connect with family and friends. ​However, some of my adult children were going through some difficult times of their own, some still are. And I had no place to live, and not being able to work, I had no money of my own to supply what I needed. I was completely dependent on Him, and He provided. I did have to bounce around a bit from place to place, and once again, no "church" would help. There still is "no room at the inn," even in my home town. It saddens me. I hope to change that someday. I am still needed here at home, and quite frankly, I still need time to rest, heal and recover from the spiritual battles when I was out in the field, and when I returned home. My Father also knew I needed more rest, so He set me up with a stable living situation and the finances needed during this time so I can pay my own way, heal properly and get the physical and spiritual rest I did not receive during my sabbatical. I am also using this time to build our family businesses. After all, we need money to feed the hungry. A lot of it. ​This ministry does not ask for donations---we don't turn them away, we just don't ask. I am not good at that and never have been. So I plan to use proceeds from our business ventures to help me fund the ministry programs that we have established. ​I didn't have a business at that time, but did have the homeless outreach and addiction ministries. With no funds to run them! Many ministries and non-profits sell things in order to create an income, and that is totally fine for them, but not for me. I am led down a different path. To each his own. Guise: "an external form, appearance, or manner of presentation, typically concealing the true nature of something"
I'm not into politics, so I usually ask the Holy Spirit for direction on who to vote for rather than researching and keeping up on all the political news. However, this year I haven't bothered considering none are my choice. The who fiasco sickens me and is embarrassing. But I'm not God. So earlier this week I asked Him what He had to say about the coming election. I didn't care to know who would be elected or who to vote for, if I vote, I just wanted to hear from Him regarding the elections. I asked, "What do You have to say about the election?" His answer was, "Prepare for war." As believers, our weapons of warfare are not carnal but are spiritual. Our weapons are in surrendering to Him, seeking Him, loving others, rebuking the enemy, and declaring Elohim's word. Let us seek Him on how we are to prepare, how we are to pray, how to show His love to mankind, and asking Him for direction. He will direct our steps if we allow Him. Remember that our greatest weapon against the enemy is Elohim's Love. Love your enemies, pray for those who seek to destroy you. We fight evil with GOOD...I'm living proof that this works for our best and to His glory. Seek our Heavenly Father on how to prepare for the seasons ahead. 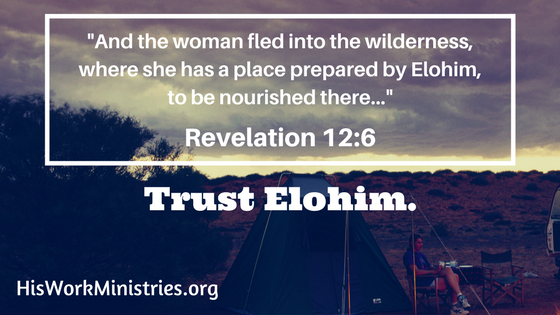 The word for 2016 is "Faithfulness" says Elohim. I am faithful to My word. I am faithful to My children. I am speaking faithfulness to a faithless generation. I am calling My children to come higher--come higher to Me in faithfulness. Be faithful to Me as I am to you. Come higher, My children, in your faithfulness to Me, for I am a loving Father and I am faithful to you. As we have entered into this Jubilee year, God was telling me to rest, to take a Sabbatical from outreach ministry. I fought it, wanting to do what I know He has called me to do. I even tried to make a compromise that I will not leave Alaska to do outreach, I will reach in my own home state. But He has allowed me to be put into a position where I have no choice but to rest from the ministry for a year. I will not leave our orphans unfed, but since we only support one orphanage now, that will be “easy”. Also, I will be writing out the teachings and any words He leads me to write out and post on the ministry’s blog. And I will be praying for our nation. After working "in the field" for three years, walking away from home, family, and everything else, I have come home to Alaska, to no place to call my home, to children who need their mom by their side, and to a business that needs my attention. As of the end of this month, I have no idea where I will be sleeping, but that has become normal for me, what I do know, is that God knows, and that is enough. What I need to do is focus on helping my children have a home to call their own. It has been a long time since we have had one. The other day, a brother was telling me he saw me in a second home in another country, happy ... and all I could think was, “What about a first home, here in my country?” We lost ours in 2010 after my daughter was in a terrible car accident. An accident we have yet to recover from. It is time. For weeks I have cried out to Him about how exhausted I am, praying for Him to send laborers in the fields--help with the ministry, with the orphans, with it all. And no help has come. I have felt like Moses when he had to hold up his arms in order to defeat the enemy, and he grew tired and unable to sustain in his own strength. But unlike Moses I have had no one to come alongside me and hold up my arms so I can continue. Not one. For the three years I was in Florida working alone in the ministry, and praying for a team, God said, "You and I are a team." And now, He has told me to rest. And I need it. As for the ministry, I have given it back to God. I have once again surrendered all to Him. After all, it is His and not mine. We will see what He will do. 1. Martial Law is coming to the United States. He said, to keep it out of your town, you need to support your local police, pray for them, surround them in prayer, appreciate them and show it. SUPPORT THEM so they can do their job without fear of backlash. 2. There is going to be a financial collapse about a year from now. God has said, this year (the Jubilee year) is a year of GRACE and the righteous will be given PLENTY---use this to stock up and get out of debt and be prepared for the times of terrible trouble that are coming to our nation. God LOVES YOU and wants you CARED for but you must listen and obey. 3. We MUST be led by His Spirit. PERIOD. We cannot see into the spiritual realm if we are walking in the flesh. God will lead you by His Spirit where you must go, and how to prepare for what is ahead. 4. LOVE is our greatest weapon against the forces of darkness. Please fight evil with GOOD. Please PRAY for those who persecute you, BLESS those who curse you, and LOVE YOUR ENEMIES! 5. We must love unconditionally and leave the judgment and criticism behind us. We are in a time of battle within the faith, the churches, the religions, and a house DIVIDED will NOT STAND! In order to have unity we must focus on what we agree on. 6. Stop bashing people because of their sin, for none of us are without it. Some of us fly ours on a flag and some hide it behind a mask, but God SEES IT ALL. Focus on your relationship with God and love your fellow HUMAN regardless of their lifestyle, regardless of their faith or lack of it. Be the face of Yeshua Messiah and BE THE HAND OF GOD--our Heavenly Father, the God of ABRAHAM, ISSAC and JACOB--The ONE AND ONLY TRUE GOD! 7. Feed the hungry and bring the homeless poor into your home, always being led by the Spirt and with DISCERNMENT. Do unto others as you would hope they would do for you. For with the measure that we measure out, it will be MEASURED BACK TO US. And please, do not grow weary in DOING GOOD. For what you do for the least of these, you do for HIM. May Elohim bless you and keep you over the coming year, may He make His face shine upon you and be gracious to you, and may He lift up His countenance to you and bring you His SHALOM. During my studies, I use a few different translations of the Bible, mainly the Amplified and The Scriptures. I use the scriptures more an more for study, slowly learning the original Hebrew names of the books of the Bible and of people. It is an excellent resource for going to the root...to inquire on the original words and meanings used, so as not to misinterpret the Holy Word of Elohim or to misconstrue or take it out of context. I was blessed with a beautiful copy of The Scriptures for a Hanukkah gift in 2014. It is my study companion, along with the Ruach HaKodesh. I have found an online format of The Scriptures, for those who are curious, or not sure yet if they would like on for themselves. Enjoy! "Welcome to the online version of The Scriptures, a relatively new translation published by the Institute for Scripture Research. Although this organization is not affiliated with EliYah's Home Page, I believe they publish one of the most accurate English translations of Yahweh's Word ever made." Since we have transferred our website to a new platform, we are also needing to set up this new blog...which involves integrating our old blog posts into this new blog. This will take some time, so please bear with us. What we are up to and how we can help one another reach out to a hurting world and give them love and hope.